The items displayed below may still appear on our printed catalogue but are currently sold out. A particular favourite with pale creamy-pink, double hose-in-hose flowers. Good spreader in sun or part shade. 50cm. high. Very unusual form with very large, creamy-yellow flowers. 45cm.high. For reasonably well-drained soil in sun or part shade. 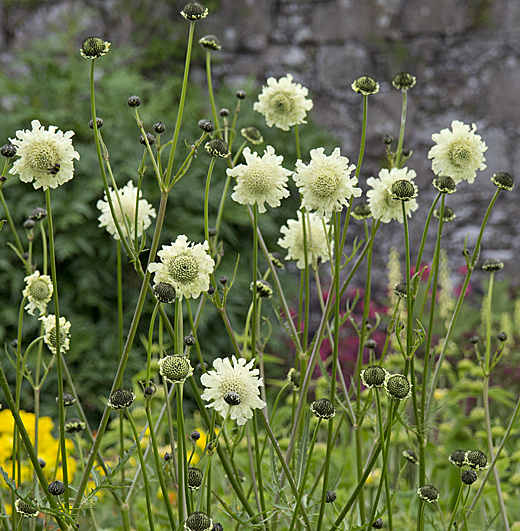 Very showy, tall upright perennial clump-former with abundant large pale-yellow, scabious-like flowers in summer. Invaluable in my hot border. Easy in ordinary soil, sun or part shade. To 150cm high. 60 cm. spread. The 'Hairy Chervil', like a beautiful pink cow-parsley, easily grown, even in dry shade. Late spring and summer. Good perennial. 60cm. high. Brilliant deep-red, large flowered cultivar, very floriferous. 90cm. high. A spectacular hardy Orchid hybrid with densly spotted foliage. Deep purple flower spikes in early summer. Quickly makes a clump in fertile soil and a sunny position. I find this the tallest and most vigorous I grow. 60cm. high. 1 litre pots. 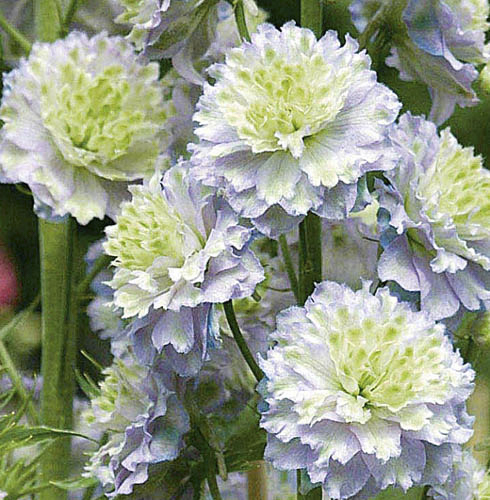 Very double frilly blooms, palest lilac, each petal softly bordered with blue, enhanced by a green eye. Fairly compact, to 100 cm. high. Best in humus rich soil in sun or part shade. Bred in Scotland by Tony Coakley. Classic Victorian variety with the strongest scent. Double pure-white flowers in May and June. Good at front of border or in containers. Sun and good drainage, 30cm. high. Tufts of grassy foliage produce strong arching stems holding pure-white dangling bell flowers, June to August. 90-100cm. high, for sun and good composty soils. 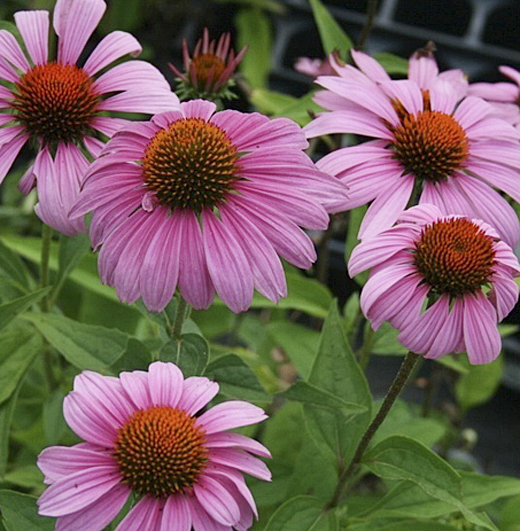 An improvement on Echinacea 'Magnus' with dark carmine-red flowers held on purple stems. 100cm. high.